Elk Lake, OR July 27-29, 2018 5 Swims in 3 Days! Entries completed by July 16 will pay the normal fees. Entries completed July 17-21 must pay a $10 late fee. The online entry system will close on July 21 at Midnight PDST. CAMPGROUND IS FULL FOR FRIDAY & SATURDAY NIGHT! FESTIVAL: Elk Lake is a great place to bring your family for a fine outdoors experience and extravaganza. Think multi-day, multi-swim FESTIVAL! ELIGIBILITY: Open ONLY to 2018 USMS members or foreign equivalents, who must be adults 18+ on Friday, July 27, 2018. USMS “One-Event” membership—covering all races—is available for adults 18+ only for $21. RULES: USMS rules will govern this event. Category II suits—including wetsuits—are welcomed in all swims, but scored in a separate category. See event website for swimwear details. STARTS & SEEDING: The 1500, 3000 & 5000-meter swims will use a mass start unless the size of the entry dictates otherwise for safety's sake. The 500-meter swim will have individual starts and the 1000-meter swim will start in small heats; both swims will be seeded fastest-to-slowest based on 500-yard seed time. Day-of-Race entries and those not submitting a seed time will not be seeded in advance and will swim last. No changes allowed in seeding times at the race, so enter accurate times. Entries completed by July 16 will pay the normal fees. Entries completed July 17-21 must pay a $10 late fee. The online entry system will close on July 21 at midnight PDST. After that, swimmers may only enter at the event site as a Day-of-Race entry, which requires a $20 late fee. Save some cash—submit your entries on time! ENTRY FEES: The basic entry fee is $30, plus $5 for each swim. Entry fee includes a swim cap and post-swim meals on your race days. Ribbons to three places in each age group in all swims in both suit categories. Special Survivor award to everyone completing all five swims. 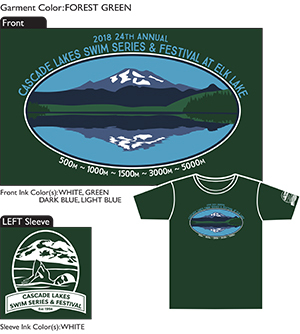 SOUVENIR T-SHIRTS: With their entry, swimmers may pre-order & purchase one high-quality commemorative t-shirt for $12 and additional t-shirts for $16. They will not be on sale at the event. HOT DRINKS & SNACKS: We'll have hot coffee and hot water for othe rdrinks to help keep you warm before & after swims. We will also offer modest snacks for our volunteers, many of whom are on duty long before swimmers arrive. Swimmers may snack too, but these snacks are limited and NOT intended to serve as your breakfast or lunch. MEALS: Swimmers will receive a post-swim meal; order vegetarian or meat with entry. Swimmers may pre-order specatator meals (vegetarian or meat) for $10 each with entry. Meals include dinner on Friday evening, and lunch on Saturday and Sunday. CAMPING: By pre-registration only (first come first served), we have reserved Little Lava Lake Campground for swimmers & spectators Thursday through Sunday. Note that this is NOT our usual campground at Little Fawn! Only tents or small motor homes are permitted. Camping fee is $8 per day per camper 12 years or older—include fee with your entry form to secure your spot. Very limited parking at the campgrounds! NO drop-in camping! DIRECTIONS (Google: Elk Lake): From Century Drive in Bend, take the Cascade Lakes Scenic Highway approximately 34 miles to Elk Lake. The start & finish for all swims is the Beach Day Use Area at the southernmost eend of the lake, last Elk Lake exit if coming from Bend. PARKING: Parking is limited to two large pullouts off the Cascades Lakes Highway, the Six-Lakes Trailhead, and the Little Fawn Group Campground. A shuttle will run Saturday & Sunday between the campground, trailhead, and the race site before & during registration and after races are completed. There will be no general parking at the race site until after event activities have concluded. Your car must display a current NW Forest Pass to park anywhere other than the highway pullouts, trailhead, or campground. Online Registration closed on 7/21/2018.